Discussion in 'The Lounge' started by Sandwich, Sep 7, 2010. What gives, planners? We doin this? 1) Bring warm stuff!!! October is chilly up north! 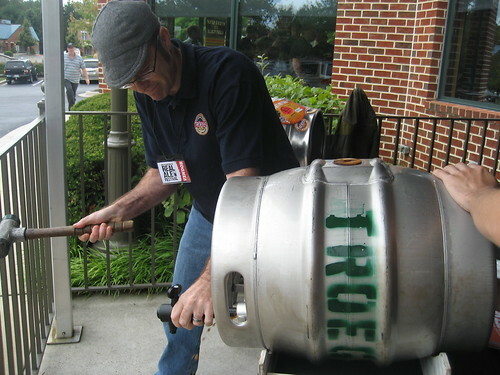 2) a Firkin of beer won't last long with our crew! Menu is TBD but I am thinking cooking inside won't be bad because it's MUCH cooler in the fall. Cost will be $75 (or less) for everything! We are waiting on confirmation for Columbus Day weekend (Oct 8-10). Been wondering the same thing myself, have some new found time off and am looking to get up to the KT before the end of the year! word turd, i had a great time up there previously, would like to try again. Plus there's some DH business going on, even more motivation. I'm definitely interested in going back for Fall m'fest. There's also a woman who started riding with me this summer who's interested in going with me. We might be interested in arriving Thurs night so we can get a full day of riding in on Friday, if that's an option! We would also be in for that weekend. Just waitin for the "all-clear" on the lodge. We have the time off, and I'm claiming the second bedroom when the lodge is confirmed. Isn't that kind of like yelling "shotgun" before the car is even in sight? If I don't claim it now, I may have to refer someone to my custom title. I'm claiming a bottom bunk, a spot on the couch during dinner, and the first breakfast sandwich. plattekill last chance for glory race is that weekend! I'd be excited about that, if the sport course didn't utilize fun run or some section of it...barf. so this is not an official call. I'm claiming the first breakfast sandwich. I'm putting in my request for time off tomorrow! You won't be awake early enough. I *believe* we are confirmed for Columbus Day Weekend...Friday night, Saturday night and Sunday night (if we want it). I will know 100% tomorrow and will post for sure but were 95% in on the lodge and if not, I will make other accommodations for us for the same weekend. This year when the official thread goes up back bedroom will be a random drawing for couples who choose to enter. How many people will be there? I might bring a firkin of something if there are enough people to drink it. I'll be there and promise to put a dent in said beer. next question...who's bringing the merkin? Mark & I promise to drink an impressive amout of beer. Bring on the firkin! NSFW yet merkin and bacon related. A dent? I thought you were a beer drinker? October?!? Isn't that ski season for you guys out East?? Yayers!!! So I can put in my request for Columbus Day weekend now? I'm bringin' a friend, too!! It's the Truffle Shuffle, haven't you ever seen Goonies? Excited for this and will hopefully bring better beer than labatt...but maybe not. Holy **** Batman! I'm sorry I got confused. Laudy was with D2. He was funny. He was hiLARious!!! IAB, did you ever post that video clip of him going down sidewinder??? Are we confirmed? I'm interested in hitting Bromont on Sunday this time if anyone is in with me. Right now I'm thinking of Millstone on Friday on the way up, KT Saturday, Bromont Sunday and Monday I'll be closing my camp on Lake Champlain. Anybody that wants to hit Bromont with me and needs a place to crash can come with me to the lake after, there are a couple of beds or we can find some space for an air mattress if needed.